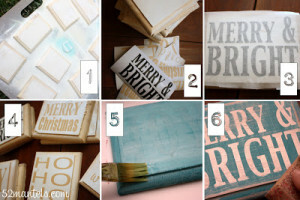 You are here: Home / Holidays / Making A Merry Christmas / DIY Mini Christmas Signs! 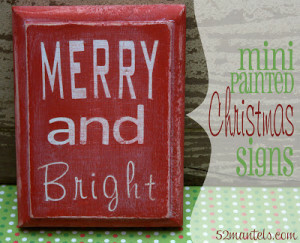 These Mini Christmas Signs are so much fun and so versatile. They can be used as ornaments on your Christmas tree, propped on a shelf or even hung from a festive Christmas wreath! I love versatile projects, don’t you? I grabbed these wooden plaques for $0.25 a piece at a flea market and I knew they’d make great mini signs! I made 8 total, and they range in size from about 3.5 inches x 3.5 inches to 5 inches x 5 inches. 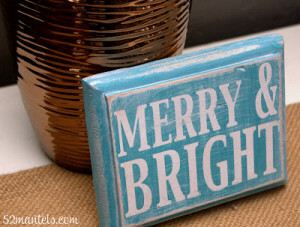 Similar plaques can be purchased at your local craft store. I used my Silhouette to make these signs, but you could always use stencils or letter stickers. 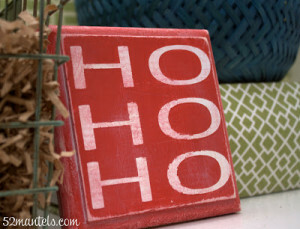 To make these Mini Christmas Signs 1) spray paint the centers of unfinished wooden plaques white 2) use your Silhouette to cut Christmas phrases out of vinyl OR gather the appropriate sticker letters 3) place the vinyl letters on the painted plaques using transfer tape OR place your letter stickers on the painted surface 4) repeat this process with each plaque 5) paint over the entire plaque with the color of your choice 6) peel the vinyl letters/ stickers off the plaques and use sandpaper to distress each sign. To the backside of a few of the signs, I hot glued bakers twine for hanging. I hung one from the center of my So-Simple Sock Wreath. It added the perfect amount of Christmas cheer to my front door, don’t you think? 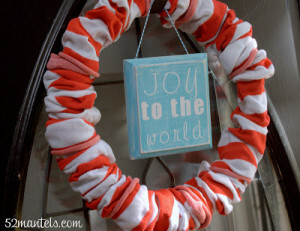 Check out some of the other Holiday Crafts Emily has shared with us!